When I was a boy, listening away in the bunk -bed bedroom up over our pub, I used to think the song I heard from down below was the Boston Burger, but it was really the 'Boston Burglar'. This young lad was sent off to jail for robbing. He was given a long sentence. The line in the song goes: "And 21 years is a mighty long time." Well, it's 21 years since Mayo beat Kerry in the championship. 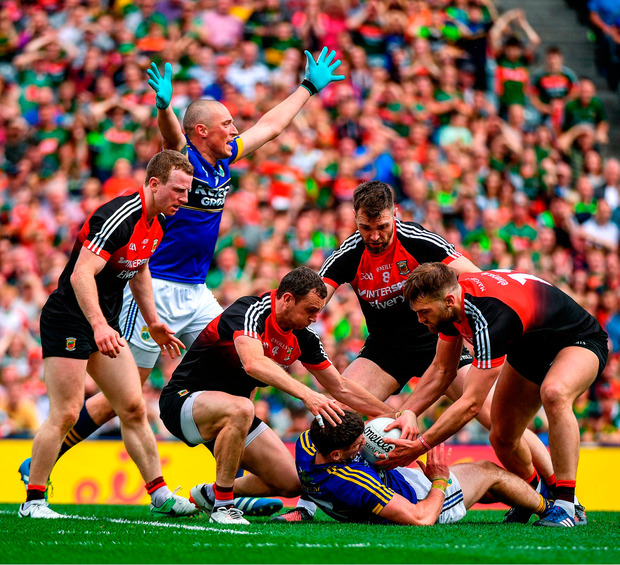 And as a Kerryman I can only say well done Mayo, and good luck to you all in the final. Kerry were beaten by a better team. We have no excuses. Mayo took their winning well. The Mayo supporters showed some maturity in and around Croke Park after the game. Mayo cried freedom right at the end and there's a homeless monkey wandering around Dublin in search of a back. But there was no rubbing it in. There's a sad enough old line in the secret eulogy for barmen, and it is "he was his own best customer." Andy opened a gym in Castlebar and must be his own best customer. He seems more mobile and his hips sway organically like the full udders of fat August Friesians on their way to the milking parlour. But it is the eye for the gap that gets the goals. Andy Moran could thread hairy silage twine through the eye of a needle. Cillian O'Connor works so well with Moran. The two-man full-forward line is like a marriage. The participants must be given their own space. His brother Diarmuid punched in the first goal, and is maturing in to the ideal wing-forward who marries work with scoring. Three O'Shea brothers took the field. Seamus was the most effective midfielder on view during the crucial early exchanges on Saturday. He read the Kerry kick-outs like he had already seen the movie. Mayo were on top in almost every position. Lee Keegan was much better second time round. He stopped most of the eejitin' and concentrated on what he does best, which is driving on with ball in hand. Colm Boyle is a hybrid. He can attack and defend without any fill-up at the pumps. The wing-backs owned the ball. The referee handed out more cards than an undertaker at a game of Russian roulette. Most were justified. Peter Crowley, who was very good, was hard done by. Darran O'Sullivan was very badly wronged and we lost our big impact sub. But that seems to have been on a linesman's intervention. Keith Higgins got away with a hand trip on Kieran Donaghy, and another pull-down just after that. The ref had a quiet word. But Mayo have often been wronged by refs. Keegan's black card last year was harsh. And Kerry escaped a black in the epic Limerick semi of three years ago. Aidan O'Shea's sole made strong contact with Kieran Donaghy's injured foot. Donaghy lost it and struck out. The ref had no choice but to red-card him. My guess is he will retire now. But you'd never know. The referee didn't cost Kerry the game. Mayo cost Kerry the game. I'm only referring to the referee by way of fairness to Crowley and O'Sullivan, who are taking their unfair dismissals very badly. They deserve a full apology. James O'Donoghue should have started for Kerry. Wet weather doesn't suit him. He's top of the ground and dry ball. Johnny Buckey did well at times but Donaghy was Kerry's best player. Several scores came from him. Unsung hero Brendan Harrison gathered up the breaking ball. Harrison saved Mayo. 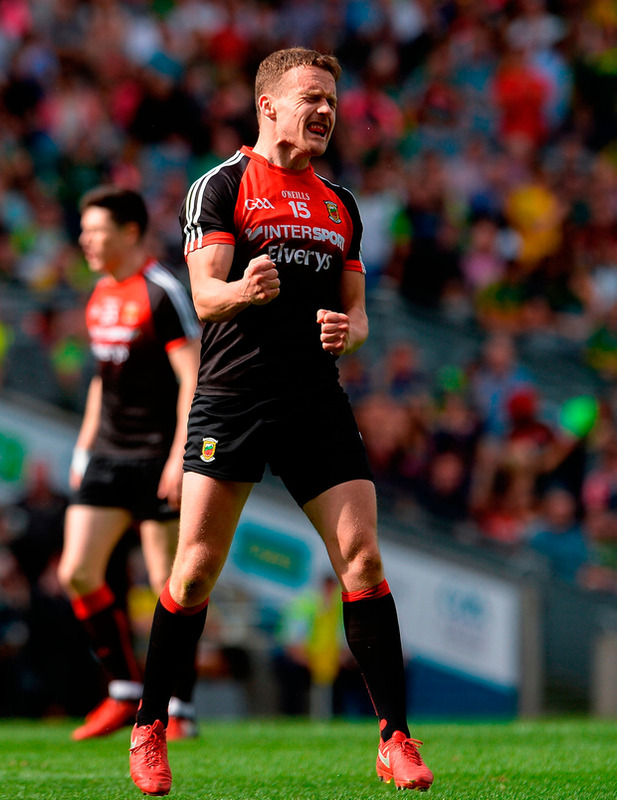 Patrick Durcan, another unsung hero, has scored 18 points in the championship. And mostly off the bench. Ye are sung now lads. Mayo manager Stephen Rochford will by now have acquired an appreciation of the nature of criticism. It's all about winning, Stephen. If you win you're a genius and if you don't … and sure you know the rest yourself. Kerry have work to do. We were gloomy too 21 years ago, but Kerry won the All-Ireland the following year. There are young players coming through and we have the nucleus of a team that will be competitive. How long will the revival take? There is no such thing as team-building in Kerry. We are expected to win every year. Most of Kerry were calling for a sweeper. That decent man Eamonn Fitzmaurice played a man in front of the full-back line. The plan didn't work. But when we took out the sweeper, it was 'Open Sesame'. You can't blame the manager for everything. The win over Dublin in the league was a bad thing for us. There was no hurt left. It was as if beating Dublin in a classic made up for previous defeats. Let's play the Kerry way. Have a cut. Show no fear. Mark like a membrane but attack, attack, attack. In football it's the team that scores the most that wins, no matter how much the opposition scores. Kerry will be back, and when we do come back, we will take some shifting. But Saturday was all about Mayo and the bond between team and supporters. To the Mayo supporters I would say, keep it low-key, for the sake of your beloved players. Give them space. Flags and bunting never won a match but heart, love and cheering did. Wait for the game. Mayo's Marco Polos are only a stop away from home. One more game, or one more year? Which is to be?